The Podcasts app on iPhone allows users to adjust playback speed, making the podcast play faster or slower. If you’re wondering why it’d be helpful to adjust the speed of podcasts, there are several reasons; increased comprehension or understanding, speeding through uninteresting parts of a podcast, or perhaps my favorite use which is to listen to more podcasts in less time by increasing the playback speed. Think you don’t have time to listen to a podcast because it’s too long? Think again, just speed it up. Can’t understand what some rapid-fire speaker is saying? No propel, slow it down. 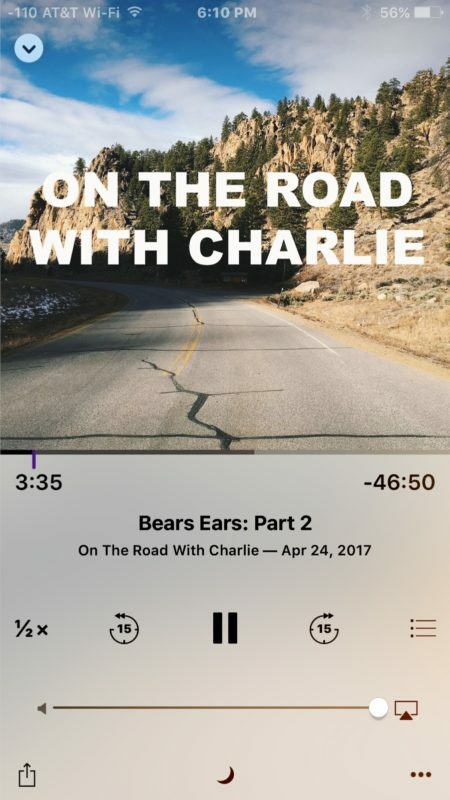 Adjusting the playback speed of podcasts on iPhone is easy and can be toggled directly within the Podcasts app at anytime, similar to how you can skip sections. Let’s review how this works. You can adjust the podcast playback speed at anytime in a podcast just by tapping the 1x button. Speeding up a podcast will have an impact on the speakers voices, sounds, music, and all other noise within the podcast episode, so it’s a good idea to use the feature conservatively as a 2x speed increase can really make things sound funny. Slowing down a podcast is mixed, while it can increase comprehension if someone is talking way too fast, it can also sound funny. I would not necessarily recommend slowing down a podcast with this method unless you really want to for some reason, because it often has the peculiar effect of slurring the speakers voices and making them sound heavily intoxicated. It’s worth noting that changing YouTube playback speed does not have nearly as strong as an impact on the voices and sounds of the show, so it may just be an algorithmic adjustment that makes people sound like chipmunks when sped up or drunks when slowed down. This suggests that a future version of iOS Podcasts app could theoretically improve the playback adjustment to have less of an impact on the pitch of voices. Another option to skip through parts of podcasts or to to scrub through them using Control Center slider or the slider in Podcasts app, but then you wouldn’t hear any of the discussion at all. Using “Overcast” for years now: best podcast app with intelligent (“smart”) speed recognition and pitching! Concur: Overcast handles increased speed (and so much more) with ease. I found the apple podcast app (and its support system) too clunky. I’ve been listening to more podcasts since I switched to Overcast. Couldn’t agree more. 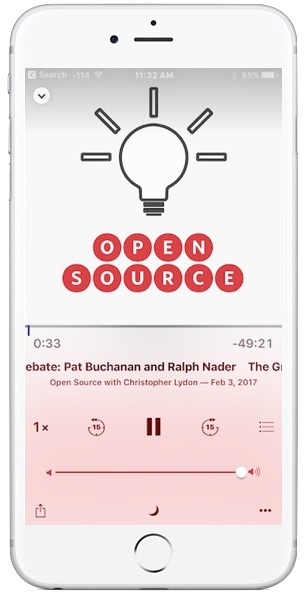 Overcast is just great, has all these facilities built in, and feels like the Podcast app of many years ago – i.e. “It just works”. Do yourselves a favour; dump Podcast and use Overcast. er….that 1x, 2x, etc., seems to have disappeared in iOS 11; and once I downloaded iOS 11, ALL my podcasts are playing back in 2x, even when I don’t want them too. HOW TO FIX THIS IN iOS 11?! OK; forget it; now that I’ve complained, I (finally) found it! I’m having a problem finding the 1 x, etc. on my IOS 11.4 I Pod. Unlike DP Huntsman, I can’t locate it. Any help? How can I make the speed change in iOS 11.4? Am unable to find these speed indicators, and it is running fast. 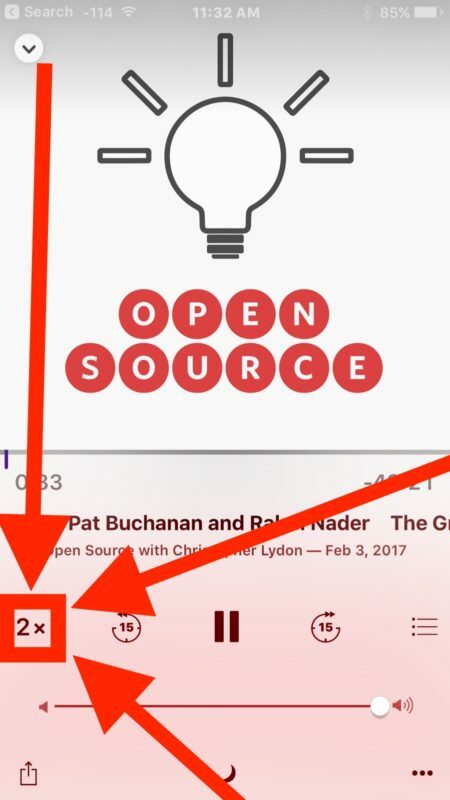 You need to open the Podcast app and play a podcast to find the speed changes available there as directed. You can slow down a podcast, or speed it up. I love the Apple Podcast app, with one exception. The App needs a 3/4 speed setting like YouTube for fast talkers. 1/2 speed is way too slow for faster talkers, even for guys like known fast talkers like Ben Shapiro! (He sounds like a reasonable guy at 3/4 speed on YouTube, with a normal human being voice). So how can we input to Apple to add the 3/4 speed setting. There is little voice distortion at 3/4 speed. We can use poor Ben Shapiro as the test case for implementation.